Yes, these are empty bottles. 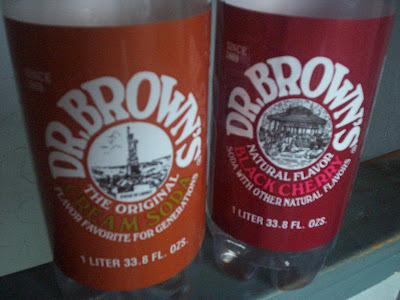 In the spirit of Passover, we decided to try something that we only see around the Jewish holidays - Dr. Brown's soda. We grabbed a bottle of cream and a bottle of black cherry from the shelf at Stop & Shop and couldn't wait to try it. After all, we'd been watching The Gefilte Fish Chronicles all week and felt that we could now hang with our Jewish peeps. THE VERDICT: Sweet. I don't know how else to describe it. Perhaps it's because we only drink diet soda now, but Dr. Brown's really had a sharp bite to it. It left that kind of sugary film in our mouths, but aside from that, it had a lot of flavor. Would we try it again? Maybe. I'd like to try the diet version, but I'm not sure if Dr. Brown is making his soda sugar-free.